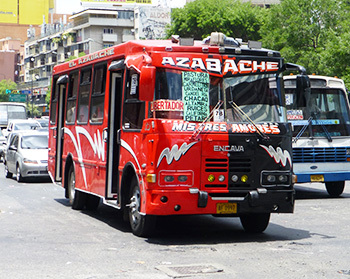 Our Venezuela pages are for bus hobbyists and the bus industry. As a bus hobbyist you want to visit all the bus pages and see the thousands of bus images. For the bus industry the pages on companies show structure, operators, fleet information and information on bus builders. We start with some recent various pictures and with Caracas bus rapid transit system, inaugurated on october 3, 2012. In contrast Colectivos Venluz operated old Mercedes-Benz O317 buses. In the meantime we have several 100 pictures of a dozen operators! Please note: we do welcome information, additions, corrections, and so forth, but we do not have the capacity to answer your questions on bus schedules, so please contact the bus companies directly.